I needed something to revitalise this poor blog, so I decided to start a series of resources giveaways—a monthly set of colour palettes taken from the inspirations I’ve been finding in the last month, and a weekly set of textures. All of these will be licensed under a Creative Commons license, so you can (and should!) download them to use in your own art & design work. You’re welcome to use them in commercial work if you credit me, but you may not resell them or redistribute them without credit and a link back. If you find these useful, please consider backing me on Patreon—with your help, I can not only keep doing this, but keep eating and buying paint and living in a house, too! 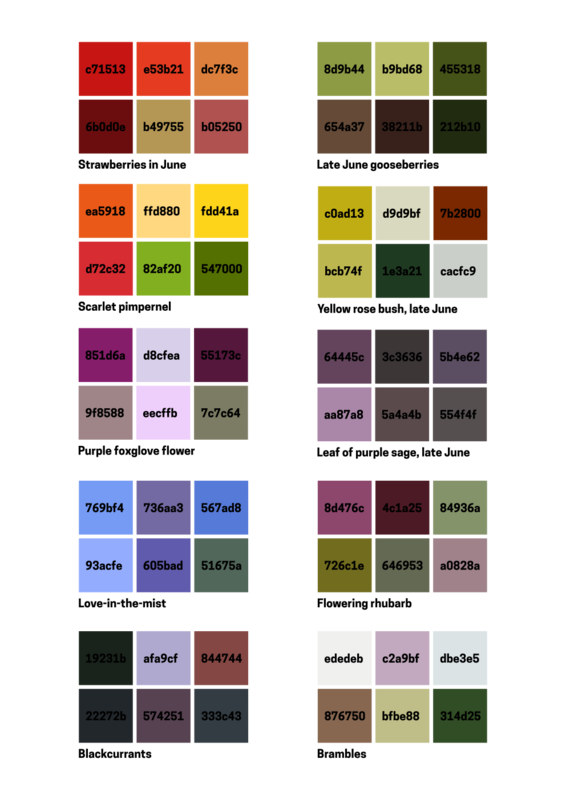 Here’s the first set of colour palettes— this last month, I’ve been doing a great deal of work on my allotment, so the colours are all taken from the fruit & flowers there. We have bramble flowers, purple sage, flowering rhubarb, love-in-the-mist, a yellow rose, blackcurrants, strawberries, gooseberries, foxgloves, and the elusive scarlet pimpernel.